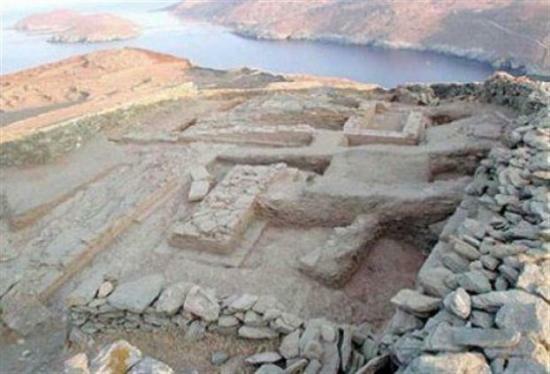 - FRANCE – Machecoul - Un diagnostic archéologique préalable aux aménagements de la Zac Richebourg Sainte-Croix à Machecoul avait été effectué en 2008 par Frédéric Mercier de l'Inrap (Institut national de recherches archéologiques). Ce diagnostic avait révélé une succession d'occupations archéologiques. Au vue de cette première évaluation et du fait du contexte historique local très riche, le Service régional de l'archéologie a prescrit une fouille archéologique préventive. Celle-ci a été réalisée par l'archéologue Camille Scaon (Archéo-Loire) d'août 2009 à mai 2010 sur une superficie totale de trois hectares. Avec ses collaborateurs archéologues, elle a repéré plus de 1 700 structures archéologiques variées, s'échelonnant du Paléolithique à la fin du Moyen-Âge. Ont été mis au jour des traces d'établissements agricoles gaulois et antiques (du I er siècle avant Jésus Christ au IV e siècle de notre ère), une petite nécropole datant de la fin de la période antique et une partie de la basse cour de la motte féodale du premier château des seigneurs du Pays de Retz. - GRECE – Rhypes – Kyrenia – Helike - Découverte de plusieurs temples dans le nord du Péloponèse lors de récentes fouilles : un hékatompédon richement sculpté de la fin du VIe siècle av sur le site de l'antique Rhypes (Achaïe), sur le site de l'antique Kyrénia un temple du VIe et un du IVe, (plus un habitat protohelladique et des tombes d'époque mycénienne), et un bâtiment à abside du VIIIe qui pourrait être le célèbre temple de Poséidon d'Héliké. - MALAISIE - Information Communication and Culture Minister Datuk Dr Rais Yatim said 75 sunken vessels have been recorded in Malaysian waters. "This is not the actual number as many sunken vessels were not recorded. Location of most of the vessels are difficult to determine except using equipments with sophisticated technology," he said. Sim wanted to know the number of sunken vessels identified and whether the government intends to salvage them and their estimated value. - ROYAUME UNI – Bredwardine - Archaeologists are due to start a three-week dig in Herefordshire in search of a buried Medieval village. Herefordshire Archaeology, the county's archaeological service, and The University of Manchester, will excavate trenches in The Knapp, in Bredwardine. Previous digs at the farm have unearthed prehistoric flint tools. The dig lasts from Monday until 17 July. The team said more evidence of early settlements would widen knowledge about the dispersal of early societies. 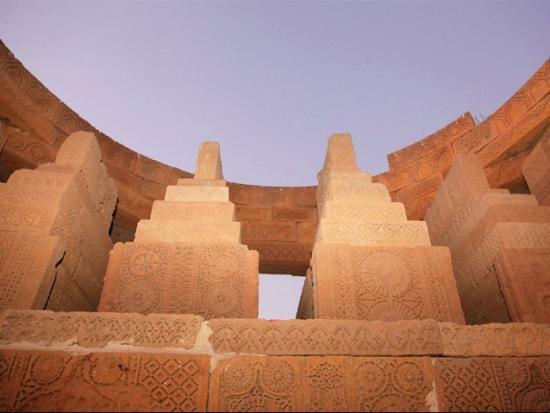 - PAKISTAN – Toti Chowkandi - The Chowkandi graveyard, near Sohrab Goth, is being chipped away bit by bit, as the magnificently carved stones are stolen from the 15-foot tall graves. Legend has it that people of the Kalamti tribe, who are buried in the graveyard, also put treasure in the tombs. 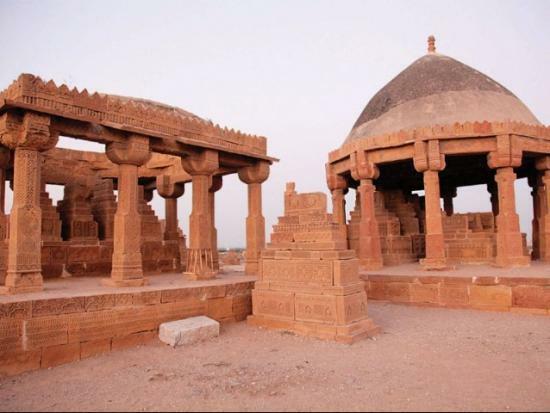 Over the years, many people have dug them up in an attempt to hunt down the buried treasure — ruining the intricately built monuments at Toti Chowkandi. The Kalamti tribe is believed to have migrated to Murad Memon Goth, 15 kilometres away from Karachi airport, in the 18th century, from Lasbela, Gwadar, Pasni and other areas in Balochistan. According to Sindh Archaeology Secretary Kalimullah Lashari, the area used to be called the ‘chowkandi’ (four corners) of Malik Tota Khan, the Kalamti leader who is also buried here with his tribesmen. The Kalamtis were prosperous and powerful people. “At that time, in the 1700s, each grave was built for about Rs10,000,” says Lashari. For the people of the Kalamti tribe, being buried here was an honour. Even though similar graves were found in other areas, Chowkandi had a special significance to the people. The graveyard are spread over 60 acres. Besides theft, the site also faces the danger of being engulfed by encroaching commercialisation of nearby areas. This site has priceless stone carvings. The government should do something, otherwise, precious stones on the graves will continue to get stolen. 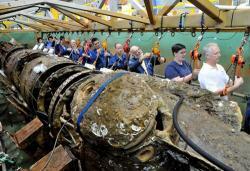 - USA – Charleston - Scientists began rotating the 148-year-old Confederate submarine. Engineers and scientists at the Warren Lasch Conservation Center began rotating the Confederate submarine into an upright position -- 3 millimeters at a time. The pace was plodding, the progress barely visible, but then speed wasn't the objective. The idea was to right the sub without putting any stress on its iron hull. This was accomplished by slowly adjusting the 15 straps that cradle the Hunley, and keeping a laser sight running from stern to bow that would detect any twisting of the hull. This is a major step in the Hunley project, one last engineering puzzle before conservators put the sub through the restoration process. The Hunley has rested on its starboard side since it was recovered from the Atlantic Ocean in 2000. Archaeologists wanted the sub lifted in the position it was found to avoid moving artifacts inside the sub. The Hunley has remained in that position ever since. But now the entire hull needs to be exposed so that conservators can remove the crusted sand and shell that covers the hull in preparation for the Hunley's restoration. - CANADA – Low Point - An archaeological dig at a rare 18th century Acadian home near Port Hill has become somewhat of a race against the elements. 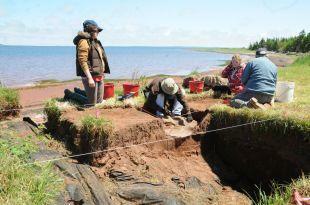 The site is located at Low Point, along the shores of Malpeque Bay. But the picturesque location masks the fact that erosion has taken a toll on the historical goldmine. "Erosion is an issue all over the Island and, since these Acadian sites are often coastal, it's a big concern for us," said Dr. Helen Kristmanson, director of archaeology for the Province. Kristmanson identified the pre-deportation home while surveying the area back in 2006. 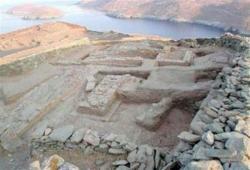 She and her team of archaeologists have been excavating for a few weeks each summer for the past three years. An estimated 8,000 artifacts have been found at the site since that time: glass beads, religious pendants, smoking pipes, nails and animal bones, which indicate what the Acadian settlers were eating back in 1728. "This is a site where the Acadian families got advance warning of the deportation, so they probably had enough time to collect up things and pack before they left," Kristmanson said. "After they left, the British didn't destroy their houses, which they usually did." Kristmanson plans to meet with the transportation and environment departments to develop a strategy to keep the erosion at bay. She also hopes to work with climatologists to identify historical sites around the Island that are most vulnerable to erosion. - PHILIPPINES – San Remigio - Jose Eleazar Bersales, co-director of the University of San Carlos and University of Guam Joint Archaeological Fieldwork in San Remigio, said that the artifacts would be sent to the United States for radio carbon dating to determine the “absolute date” of the materials. Bersales said that they had unearthed around 4,000 specimens from their archeological dig in San Remigio. Bersales said in a statement that they had uncovered six burials and 14 earthenware jars and some 3,000 accessioned artifacts believed to be dated back from the Philippine Iron Age, which is between 500 BC and AD 900. Bersales said that it was the first time they had recovered artifacts dating from the Philippine Iron Age in Cebu. “It strongly suggests that there’s already a thriving settlement in Cebu,” he said. Their recovered artifact include one burial interred with six different types of earthenware jars near its feet, an iron tool near its chest and the jaws of a wild pig placed near its left wrist. Bersales said that many of the earthenware from the burials had bodies that angled sharply to create a hip, which are typical to the sa Huynh-Kalanay Pottery complex, which was also recovered in Vietnam and in Masbate. - FRANCE – St Jean d’Angely - La société d'archéologie et d'histoire a acquis le Logis-Le-Clouzeau pour y faire des fouilles. « Il s'agit des vestiges d'un château, a priori féodal, il aurait visiblement été démantelé après la Révolution pour construire le château de Beaufief », précise Alain Bense, vice-président. Ce nouveau projet motive les membres de l'association, qui espèrent remettre à jour les vestiges du château, mettre en évidence les traces d'une occupation des lieux vers le haut Moyen-Âge ou peut-être même l'époque gallo-romaine.